As is immediately clear, the meme was a success. Two weeks ago I uploaded the photo to imgur and tagged it with five tags: school, college, work, university, and high school. I did not promote or otherwise share the image in any way until 4 days ago, by which point it had amassed 650 views. Because I hadn’t promoted the image to get to that view-count, I pressed on and set a goal of acquiring atleast 500 more new views from my own efforts at websites other than imgur. 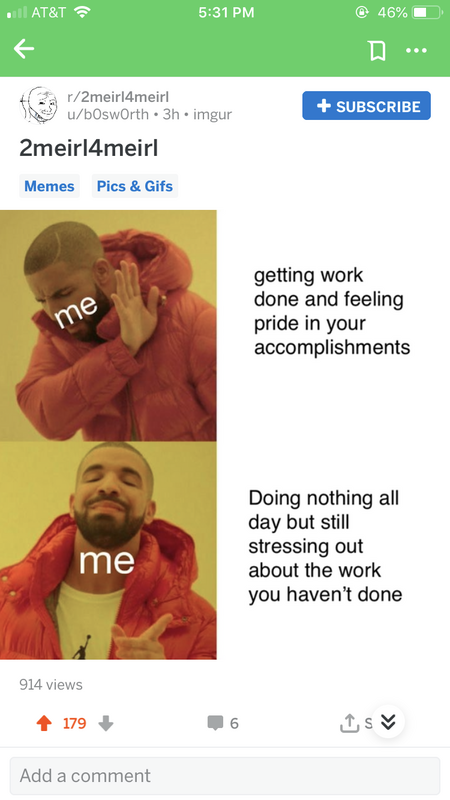 Thankfully the very first place I posted it, a reddit subreddit called “/r/2meirl4meirl”, upvoted the meme quickly and within hours it recieved thousands of views and 700 upvotes. It’s worth explaining that “2meirl4meirl” is a spinoff subreddit of a more popular and broader meme subreddit simply called “me_irl”. In both of these subreddits, the name of the post must always be the name of the respective subreddit, and nothing else. This essentially means that the titles of every post in the subreddit will be the same, requiring users to open each post to get any hint of its content, beyond the tiny thumbnail image next to each post’s title. I also used Twitter to promote the post, receiving almost 1000 impressions with only $2.50 of the $5 total spent. I didn’t expect Twitter to contribute a significant number of views to the campaign, but as the reddit performance shows, the meme seems to resonate in some way with people which of course helps in spreading the meme as far as possible. It received a modest 21 favorites, but as I’ve said, I didn’t anticipate it pulling the majority of the weight. From the beginning of the project, I was confident that reddit would be a perfect tool to share a meme and attempt to achieve a certain number of imgur views for a few reasons. First, I feel relatively confident in my knowledge of reddit’s most popular meme subreddits, and reddit culture in general, to the point where I could design a post specifically to appeal to a certain group or culture. Second, because of the way reddit always uses links to show a post’s image, instead of hosting the image on reddit, (the same way WordPress does), this guarantees that a user interested in seeing the post is automatically viewing the post on imgur, contributing to my view count. This is a much more efficient system for my goals than Facebook for example, which would require the user to click on the image and visit the imgur site in order to register a view on the post. The subreddit I posted the meme on, “2meirl4meirl” is a place for memes that are so relevant and accurate to one’s own life that the meme goes beyond humor and becomes depressing. For example, a meme about never being able to plug in a usb stick the first time would not fit in the subreddit, but a meme like mine or about seeing your parents get visibly older every time you see them would certainly find a home on 2meirl4meirl. I also posted the image on /r/teenagers but it failed to gain nearly as much traction, partially because on weekends the subreddit does not allow posts with images in the thumbnail and instead force users to make posts that only contain text so as to encourage conversation and discourage meme posting during the more busy weekend time period. For that reason, users were required to click the link inside my text-post to register a view, hurting my chances of gaining mass appeal. Overall this project was an exciting way to show off my reddit skills, and made me curious about how my knowledge of reddit’s many subcultures could be marketable in any way. Food for thought! I cannot say for sure if any of my 960 twitter impressions contributed to the overall imgur total, so I won’t total up the engagements any further. Also, each source independently fulfills the quota.